Palli Karma-Sahayak Foundation (PKSF) pursues a life-cycle approach to human progress, catering to the appropriate needs at all stages of life — from the conception of a child and to the death of a person. 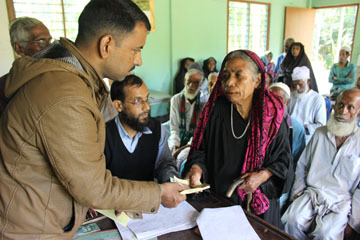 As a supplementary intervention of its multidimensional poverty alleviation programmes, PKSF has introduced the ‘Uplifting the Quality of the Lives of Elderly People Programme’ in line with the government’s elderly policy. 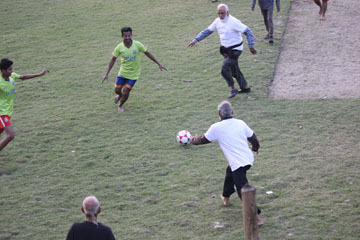 PKSF aims to help in reducing miseries of the elderly people through the programme. 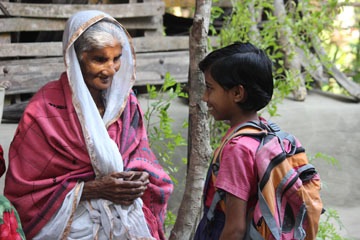 The programme assists elderly people to access social safety services, financial benefits and primary health care services of the elder person. The Source of fund for the programme is the Special Fund and Programmes-Support Fund of PKSF, and surplus of credit programmes of Partner Organisations (POs). The following activities are being implemented under the programme. Offering physiotherapy services & geriatric nursing to the elderly by organizing training for the Physiotherapy Aide. Rehabilitation of poor and distress elderly in community. Funding of the programme is being mobilized from ‘Special Fund’ and ‘Programmes-Support Fund’ of PKSF with 10 percent surplus of credit programmes of Partner Organisations. PKSF bears 50 % while POs bear the rest operational expenditure. A budget of BDT 9.54 crore has been approved to run the programme for FY 2017-18. 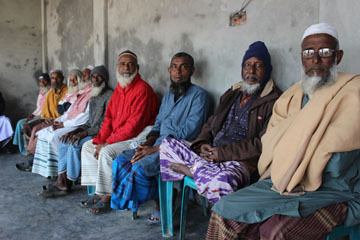 Under the programme, the following activities are being implemented in the working areas: Establishing social centres for the elderly people in every Union, Providing old age allowance, Providing assistive materials ( walking sticks, high commode, blanket etc), Offering Special savings and pension fund, Recognising elderly persons’ contribution to society, Bestowing awards to the best children for serving their parents, Providing appropriate credit and training facilities to the poor elderly people, Training up physiotherapist to provide geriatric nursing and Creating special social facilities for the elderly people. Uplifting the Quality of Lives of the Elderly people Programme is being implemented in 234 Unions in 64 districts through 116 partner organisations across the country. As part of the plan of action a survey has been conducted in selective areas to find out the socio-economic status of the targeted elderly people. Multi-tier committees have been formed at villages, ward and Union levels for operating the programme. So far 2800 elderly committees–100 Union committees, 1800 village committees and 900 ward committees have been formed till June 2018. The elderly people have been provided leadership and communication skill development training to increase their negotiation skills. Elderly programme is entirely managed by local elderly people. Under this programme, provision of establishing Elderly Social Centre in each Union has been kept to create a common platform for the elderly people. This multi-purpose Social Centre is being used to meet up the recreational as well as social needs of the elderly people. Land of the social centre is being arranged through donation from local people. 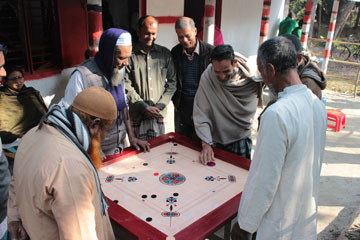 There are different types of recreational arrangement for the elderly people: indoor games, television, newspapers, Carom, Luddu etc. Elderly people use to come and discuss various issues at the centre. This centre is being used as a platform of unity of the elderly people. The construction of ‘Social Centres for the Elderly People’ has already been completed in 47 Unions. To cover the basic needs of the elder people, provision of Old Age Allowance has been made for the underprivileged elderly people. With this allowance many elderly people are being able to buy necessary medicines and avail treatment of their old aged complications. PKSF has provided TK 3. 85 crore (monthly BDT 600/- per person) as Old Age allowance to 8000 elderly people up to June 2018. This programme offers different assistive materials to ease the lives of the elderly people. 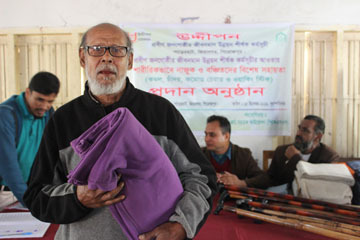 116 partner organisations distributed 1798 umbrellas, 1806 walking sticks, 1876 raised commodes, 5350 blankets and 3903 warm cloths to elderly people. 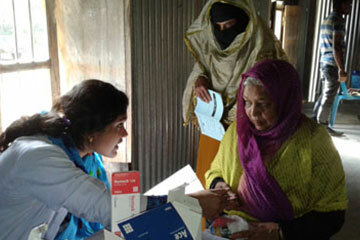 In the same manner, PKSF are making every effort to meet the needs of the people from birth to death. In some circumstances it is found that people are even unable to bear the expenses of funeral of deceased. 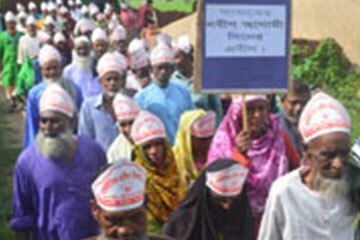 PKSF ensure proper funeral of every deceased elderly people. As of June, 2018 TK 23.56 lac (BDT 2,000/- per person) has been provided to bear the funeral expenditure of 1178 deceased. 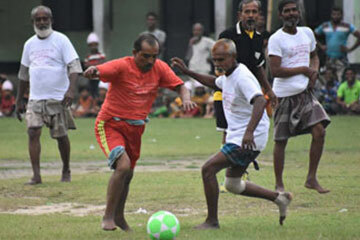 Recognizing the contribution of the elderly people towards the society is a key component of the Elderly programme. It also bestows award to the sons and youth for their support to the elderly people. 809 elderly person and 368 young people have been awarded for their noble work so far. This programme also ensures the accessibility of senior citizens to employment, income generating activities, micro-credit, markets and assets. Till June 2018, a total of 1,210 elderly people were provided training on different IGAs. 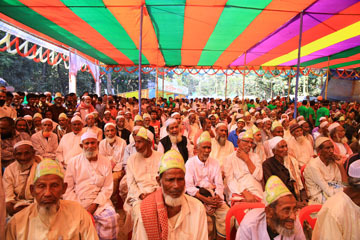 The programme has provision of health and care facilities for the elderly people. PKSF has provided training to one male and one female on physiotherapy and posted them at Elderly Social Centre for delivering services to the ailing elderly people. 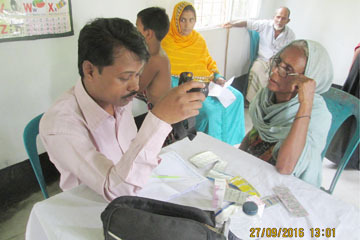 A total of 17098 elderly people received primary healthcare till June 2018. 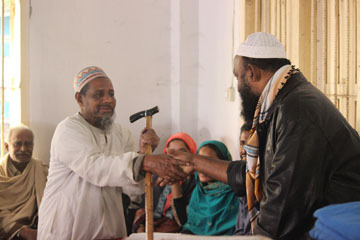 Under this programme, there is a provision rehabilitate vulnerable elderly to a family in his/her locality. Arrangements have been made to provide support to helpless elderly people. Till June 2018 41, helpless elderly people has been rehabilitated to a new family of his/her own locality. As part of on-site monitoring, senior officials of PKSF regularly visit the working areas of the Programme for the Elderly People. Besides the qualities of activities is also ensured by off-site monitiring through periodic reports and analysis. This programme has some positive impact on society. With the Old Age Allowance, many elderly people try to improve their lives. Many elderly people left begging and have started small trading. The elderly committee are creating awareness against child marriage, drugs etc. A worksop was held on April 27, 2018 for the Chief Executives and other senior officials of Partner Organisations. EDs and senior officials (Chief Credit Coordinator and Focal Person) of 12 POs implementing Elderly programme in Chittagong division participated in the workshop. Mr. Md. Abdul Karim, Managing Director, PKSF was present in the workshop as chief guest. Ms. Rabeya Sultana, Country Director, Help Age International and Mr. AHM Abdul Qaiyum, Deputy General Manager, PKSF conducted the workshop. Mr. Md. Abdul Karim, Managing Director, PKSF attended a conference titled ‘South – South Learning and Knowledge Exchange on Strengthening Social Accountability in Social Protection’. In the conference he presented a paper on Uplifting the quality of the lives of the elderly people: PKSF experience. 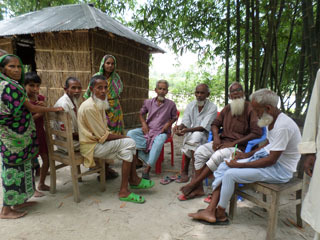 To implement the field activities, Uplifting the Quality of Lives of the Elderly People Programme has re-printed the update version of a guideline title ‘Programme Implementation Guideline’ for the support of focal person and programme organisers. The Elderly programme also published two newsletters quarterly that will contain the news and events of different cultural and sports programme. 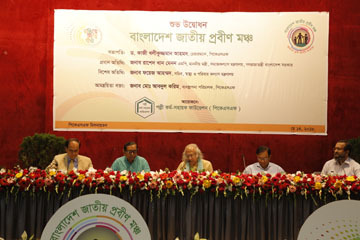 A national platform titled ‘Prabin Mancha Bangladesh (Bangladesh National Forum for the Elderly)’ has been launched under the initiatives of Dr. Qazi Kholiquzzaman Ahmad, Chairman, Palli Karma-Sahayak Foundation (PKSF). 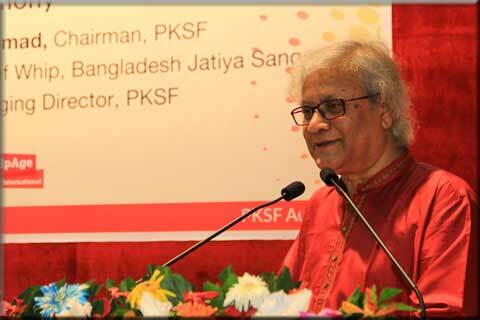 Mr. Md Abdul Karim, Managing Director of PKSF, has been pro-active to the formation of the Forum. The platform will take up various programs in light of the National Policy on Older Persons 2013. The platform, comprising different organizations and individuals working for the welfare of the elderly, is expected to play an effective role in building a senior citizen-friendly society as well as in ensuring sustainable socio-economic progress by bettering services to the elderly people. Social Welfare Minister Mr. Rashed Khan Menon, MP, graced the occasion as the Chief Guest and Health and Family Welfare Secretary Mr. Foyez Ahmed was the Special Guest at the launching ceremony. 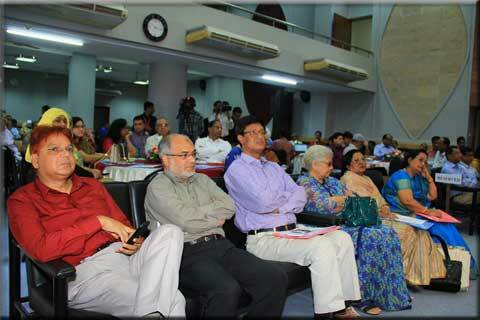 Dr. Qazi Kholiquzzaman Ahmad presided over the program held on 14 May 2018 at PKSF Auditorium. 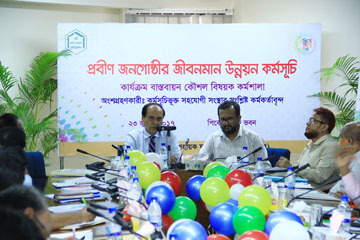 Stating that the average life expectancy of the Bangladeshis has reached 72 years, the Health and Family Welfare Secretary said ensuring collective welfare of the elderly is becoming a growing challenge, and this Forum is a “praiseworthy initiative” for addressing that challenge. Dr. Qazi Kholiquzzaman Ahmad, the PKSF Chairman, said inclusion of the elderly in the development process is a must for achieving the SDGs. During his speech as the program’s Chair, the eminent economist also announced the Advisory Committee (bn) (eng), the Executive Committee (bn) (eng) and the General Body (bn) (eng) of the newly floated Forum. 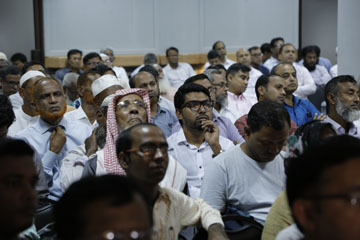 PKSF Managing Director Mr. Md Abdul Karim said PKSF is carrying out its Elderly programme in light of the National Policy on Older Persons 2013 and the Parents’ Maintenance Act 2013. He said PKSF is conducting a comprehensive pro-elderly program titled ‘Uplifting the Quality of the Lives of the Elderly People’ that ensures social and financial security, healthcare, empowerment, entertainment of elderly people. 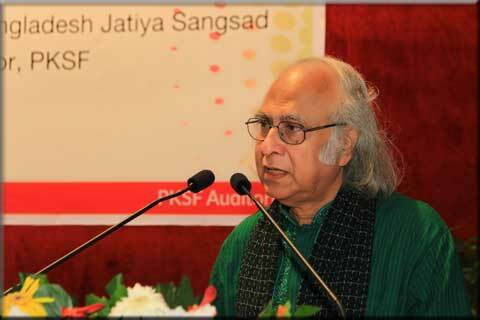 The new Forum will hopefully formulate its working strategies in line with the experiences of PKSF, he said. 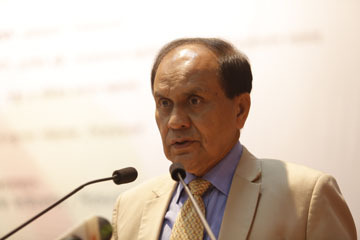 Mr Abdul Karim, a former Principal Secretary of the Prime Minister’s Office, stressed on the need for the expansion of health services for the elderly at the grassroots, incorporation of a dedicated chapter in textbooks for creating social responsibility and awareness among people, and introduction of a national pension scheme for all. A separate ministry or department can be established for expediting the pro-elderly measures of the government, suggested the former top bureaucrat of the State. “Bangladesh National Forum for the Elderly will hopefully act as a model platform for the welfare of older persons”, Mr. Abdul Karim added. Earlier, PKSF Deputy Managing Director-1, Mr. Md Fazlul Kader, who spearheads the implementation of the Foundation’s innovative ‘Uplifting the Quality of the Lives of the Elderly People’ programme, presented on different pro-elderly interventions and achievements of PKSF. 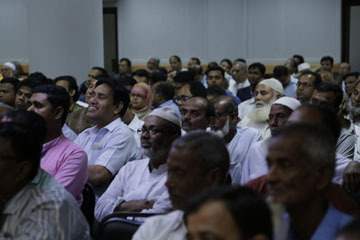 Ms Rabeya Sultana, Country Director of HelpAge International Bangladesh, Mr. Abul Hasib Khan, Director of Resource Integration Centre (RIC), and Ms Monowara Begum, Executive Director of Prottyashi, also spoke at the program. PKSF Board Members, members of PKSF’s elderly interventions and officials of the Partner Organizations concerned, among others, were present at the launching ceremony of the new platform. 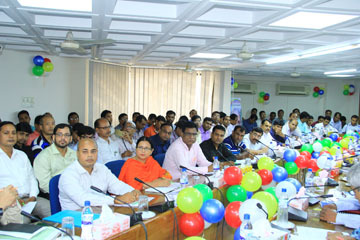 The first meeting of Prabin Mancha Bangladesh was held on September 23, 2018 at PKSF bhaban. 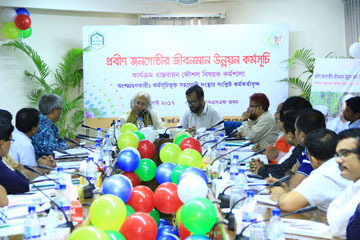 A workshop on Field Level Implementing Strategies of Uplifting the Quality of the Lives of Elderly People Programme was held on August 12, 2018 at PKSF Bhaban. 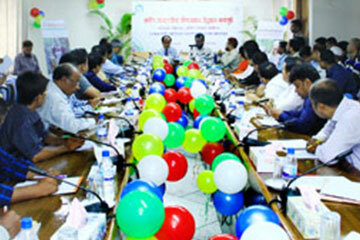 Around 220 Focal Person and Programme Organisers of new Partner Organisations were present in the day-long workshop. 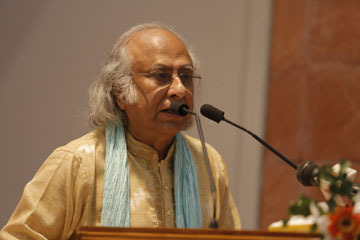 Dr. Qazi Kholiquzzaman Ahmad, the honorable Chairman of Palli Karma- Sahayak Foundation, Mr. Md. Abdul Karim, honorable Managing Director of PKSF and Mr. Md. Fazlul Kader, Deputy Managing Director-1, were present at the the workshop. The honourable guests discussed the perspective of the Uplifting the Quality of Lives of Elderly People Programme. 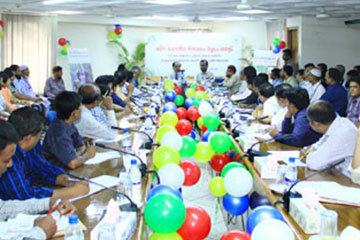 They welcome the workshop participants and gave necessary guidance to them. In his speech Dr. Qazi Kholiquzzaman Ahmad said that in order to establish human dignity it is important to manifest the thoughts of grassroot people and recognise their innovations. He said that in old age, people become ineligible in many ways. “These neglected, destitute elderly people should not rehabilitate in so-called old home rather they should be served at their own homes”. Mr. Md. 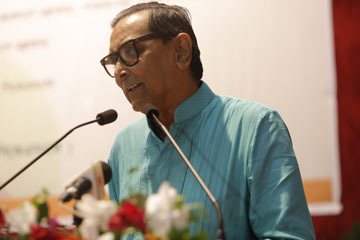 Abdul Karim in his speech emphasised the importance of inclusive development in sustainable poverty reduction. Referring the necessity of the workshop he asked the participants to contribute the workshop effectively. Mr. Abdul Karim also urged the focal person and programme organisers of the respective partner organisations to be the pioneer in uplifting the quality of the lives of the elderly people by implementing the programme at field level successfully. Mr. Md. Fazlul Kader said that like the dispersion of lights during the sunset, elderly people enlightened us with their knowledge and experiences before their departure. Comparing the old social center to the lighthouse, Mr. Fazlul Kader said “by establishing a social center, we are establishing a lighthouse which will encourage the other people to establish more”. 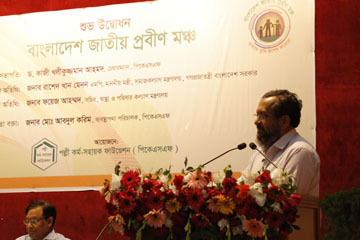 Mr. Abul Hasan Md. Abdul Qaiyum, Deputy General Manager, PKSF gave a presentation and discussed strategies for Uplifting the Quality of the Lives of the Elderly People Programme at field level. In the workshop, the respective officials gave chapter wise presentation on the ‘Guideline to Implement the Uplifting the Quality of the Lives of Elderly People Programme’. 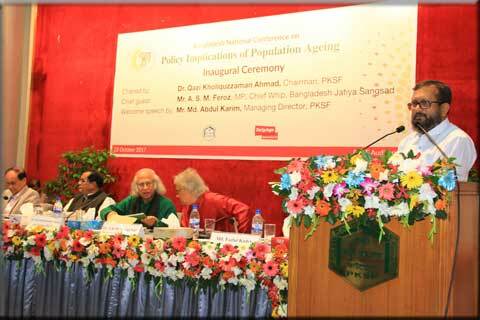 A national conference on “Uplifting the Quality of the Lives of the Elderly People Program” was held on March 2, 2017 at PKSF Auditorium. 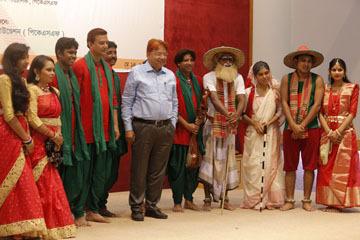 Finance Minister Mr. AMA Muhith was present in the conference as the Chief Guest. 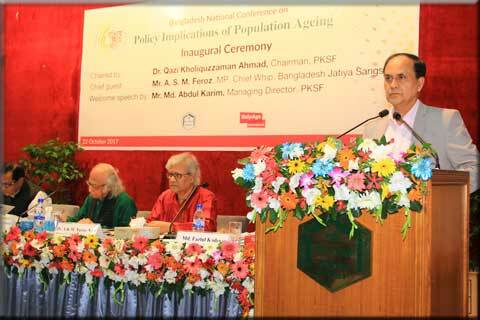 Dr Qazi Kholiquzzaman Ahmad, Chairman of PKSF, presided over the event. An exhibition on services provided by PKSF for the elderly people was displayed in the function. Mr. Md. Fazlul Kader, Deputy Managing Director-1, PKSF, presented on “Uplifting the Quality of the Lives of the Elderly People Program”. 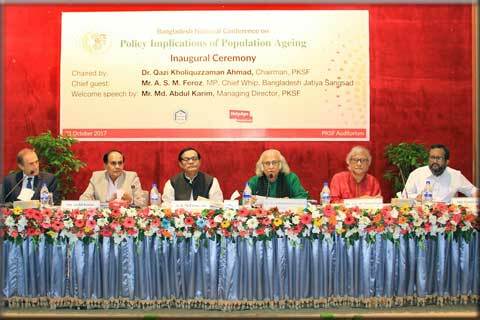 A national conference titled ‘Policy Implications of Population Ageing’ was held at PKSF auditorium on October 22, 2017 in collaboration with HelpAge International, Bangladesh presided over by Dr. Qazi Kholiquzzaman Ahmad, Chairman, PKSF. 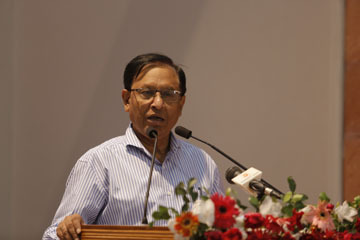 Mr. S .M Firoz, Hon’ble Chief Whip of Bangladesh Jatiya Sangsad, MP was present as the chief guest. Dr. A.K. M. Nurun Nabi, Governing body member of PKSF, Mr. Eduardo Klien, and Regional Director of Asia Pacific region of HelpAge International presented concept note papers on the policies of Population Aeging. Mr. Md. Abdul Karim, Managing Director, PKSF gave welcome speech at the opening ceremony of the conference. Mr. Md. Fazlul Kader, Deputy Managing Director (Program), PKSF, shared the experience of PKSF’s Uplifting the Quality of Lives of the Elderly People Programme. 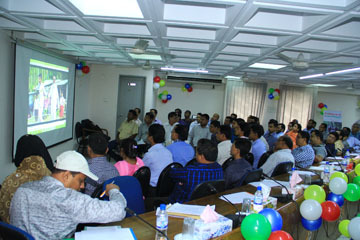 Besides, a total of 11 related articles were also presented in two technical sessions during the day-long conference.